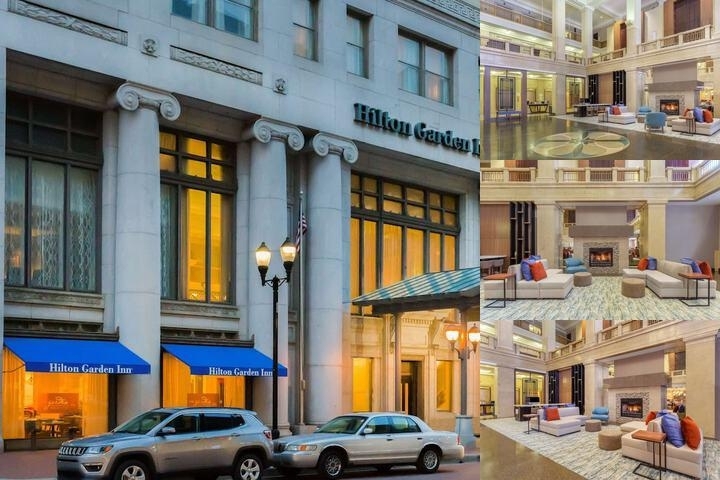 Hilton Garden Inn is located just off Monument Circle in the heart of Downtown's business, arts, and entertainment district. The hotel is located just blocks from Conseco Fieldhouse, Circle Centre Mall, Monument Circle and the best restaurants, nightlife and attractions the city has to offer! The Hilton Garden Inn Indianapolis Downtown is located in an historic building built in 1915, in the heart of downtown Indianapolis. The hotel features a full service restaurant, the Great American Grill, indoor heated pool and whirlpool, complimentary Business Center and Fitness Center. All guestrooms are equipped with complimentary refrigerator, microwave, coffeemaker, and complimentary internet service. Located 8 Miles from the Indianapolis International Airport (IND). Airport taxis readily available, average cost 25.00. Shared rides to/from the airport run about $12 one way. Local Shuttle Info: Hotel does not own/operate a shuttle. IndyGo Green Line Airpot Express is a $7 one way per person ride to/from airport. IndyGo Red Line circulates downtown for $1.75 per ride. 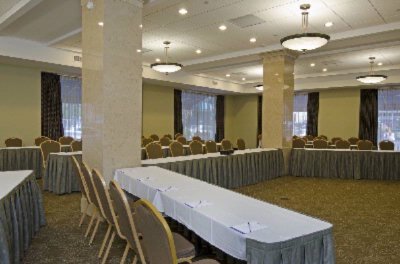 Below are the meeting, banquet, conference and event spaces at Hilton Garden Inn Indianapolis Downtown. 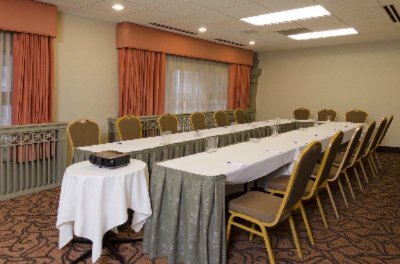 Feel free to use the Hilton Garden Inn Indianapolis Downtown meeting space capacities chart below to help in your event planning. 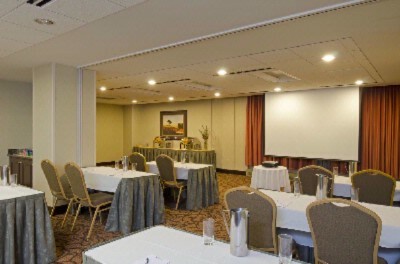 Hotel Planner specializes in Indianapolis event planning for sleeping rooms and meeting space for corporate events, weddings, parties, conventions, negotiated rates and trade shows. 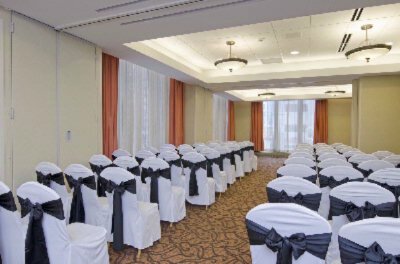 The Benjamin Harrison Ballroom is located on the first floor of the hotel. The room features 1701 usable square feet with a 14' ceiling, two supporting pillars, two walls of windows and three drop down screens. Internet is included. Harrison seats up to 120 with 5' rounds seating 10 each. 52 x 35 x 14 Ft.
James Whitcomb Riley room is located on the second floor. 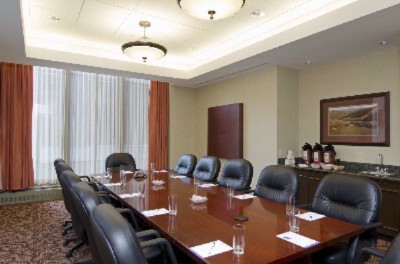 It is the hotel's second largest meeting room with 1143 square feet of usable space. The room features a 12' ceiling, two walls of windows and three drop down screens. It seats up to 60 with 5' tables seating 10 each. Internet is complimentary. 52 x 23 x 12 Ft.
Kurt Vonnegut, Jr. room is located on the second floor. It has 637 square feet of usable space. The room features a 12' ceiling, one wall of windows and one drop down screen. It seats up to 40 with 5' tables seating 10 each. Internet is complimentary. 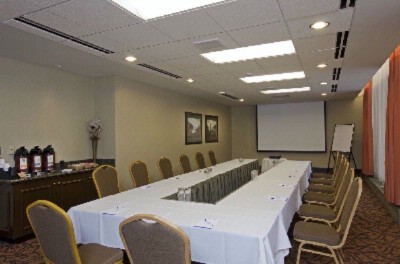 40 x 17 x 12 Ft.
Cole Porter room is located on the second floor. It is an L-shaped room and has 1063 square feet of usable space. The room features a 10' ceiling, a small window (fogged out) and two drop down screens. It seats up to 60 with 5' tables seating 10 each. Internet is complimentary. 40 x 35 x 10 Ft.
Fletcher Trust Boardroom is located on the second floor. It has 380 square feet of usable space. The room features a 10' ceiling, two walls of windows and one drop down screen. It seats up to 12 with high back executive chairs around the cherry stained table. The room overlooks Monument Circle and includes a whiteboard with markers and a sink. Internet is complimentary. 40 x 17 x 10 Ft.
Eli Lilly room is located on the third floor. It has 743 square feet of usable space. The room features a 10' ceiling, a small window (facing back of Chase Tower) and one drop down screen. It seats up to 50 with 5' tables seating 10 each. Internet is complimentary. 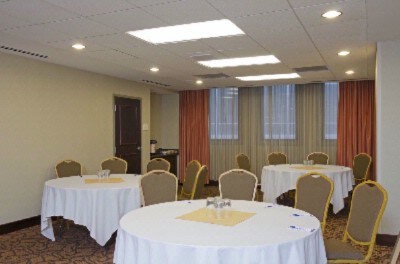 36 x 26 x 10 Ft.
Ovid Butler room is located on the third floor. It has 460 square feet of usable space. The room features a 10' ceiling, one wall of windows, unique architectural details and one drop down screes. It seats up to 30 with 5' tables seating 10 each. Internet is complimentary. 35 x 15 x 10 Ft.
Carl Fisher room is located on the second floor. 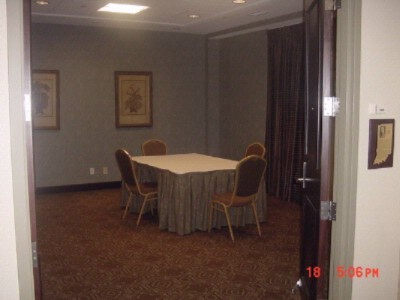 It is located across the foyer from the Benjamin Harrison Ballroom and is the smallest meeting room in the hotel at 329 square feet of usable space. The room features a 10' ceiling, one wall of windows and one drop down screen. It seats up to 20 with 5' tables seating 10 each. Internet is complimentary. 20 x 17 x 12 Ft. The Second Floor Mezzanine is a semi-private event space. It houses four of the hotel's eight meeting rooms and overlooks the beautiful lobby atrium. 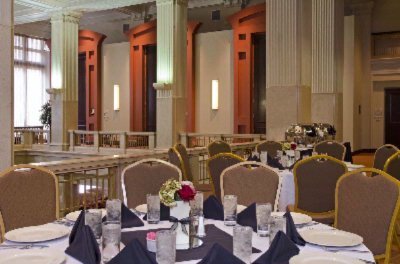 This space is great for receptions, casino games, exhibits and meals up to 70 guests seated all around the floor. This space has plenty of natural light with three large windows facing south over Market Street. 50 x 50 x 20 Ft.
36 x 17 x 12 Ft.
22 x 16 x 12 Ft.